The tile groupings above show the ten different color pairings created by the use of five colors. Each color pair has 5 different shapes of tile  as do the five solid-color "hands." It's fascinating to note that each additional color increases the number of tiles by the increments of "triangular numbers." One color is just one "hand" of five. Two colors jump to three hands; three colors make six hands; four colors raise it to ten hands, and the fifth color tops it all off at 15 hands. The series 1, 3, 6, 10, 15 is "triangular", because it adds 1, then 2, then 3, then 4, then 5. Now, wasn't that interesting? The next step is the fun of getting all those tiles together into neat shapes and color patterns. The two-sided wallhanging gameboard is vinyl that feels like leather. It has one side printed in an intricate design that can be solved with the whole set of tiles. That's a tricky challenge, because any piece could possibly fit in more than one place. The pattern looks like 5 globes of color rolling down the panel. 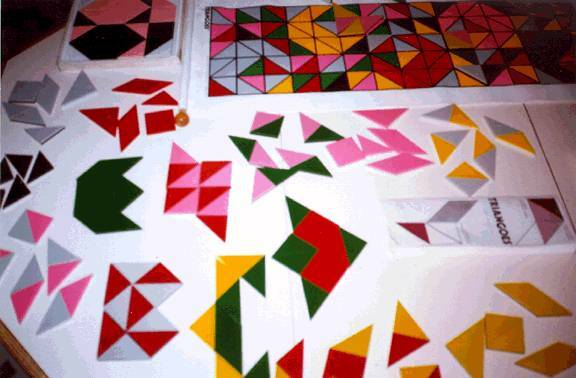 This pattern also serves as the gameboard for one of the 15 games, where up to 5 players take turns placing tiles and covering spaces so as to be the first player whose color is completely covered. The other side of the gameboard is the basic grid in black and white. It's used for the other 14 games for 2 to 6 players. There's something for everyone — short games, long games, easy games, complex games — and always a fascinating new experience.